Spruce trees, particularly blue spruce (Picea pungens) and Norway spruce (Picea abies), are popular landscape trees in Kentucky. Unfortunately, these trees present problems for homeowners when they show evidence of poor vigor, dieback, or needle drop. 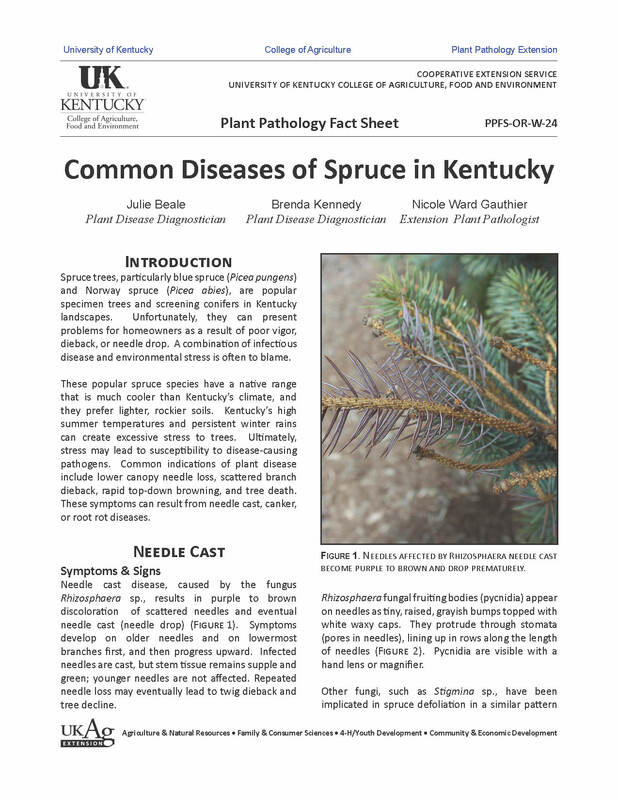 This publication discusses the most common diseases occurring on Kentucky spruce: needle cast, Cytospora canker, and Phytophthora root rot. Information on symptoms, disease development, and management options are discussed for each disease. In addition, some non-disease look-alike problems are examined briefly. For additional publications on landscape diseases, visit the UK Plant Pathology Extension Publications webpage.